Two, I’m so disappointed that summer is over and resisting it with all my might. Using peaches is my act of defiance. Take that. And lastly, I’ve been indexing the recipes (we’ll have an index page soon, I hope) and I was reminded of a Berry Pie that I made a little over a year ago. It was so good and I thought the idea would work well for peaches too, and it did. Peaches are less tart than berries so I cut the sugar content a little bit, which seemed to work out perfectly. 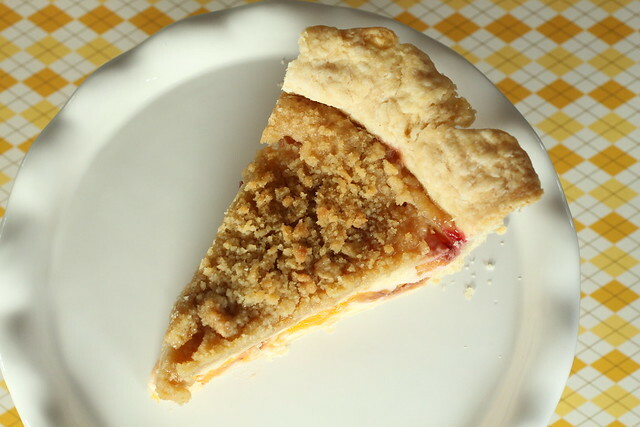 Another thing that I love about this pie, besides it’s creamy and fruity filling, is that it’s a make-ahead pie! Usually, pies are better if eaten the same day, but this one is meant to be made the day before, chilled to set (a little like cheesecake), and served just like that, no re-heating. I needed to bring something for the second day of Rosh Hashana and this was ideal. Make-ahead recipes are also helpful for Yom Kippur so keep this one handy. 1. In a large bowl, stir together flour and salt. 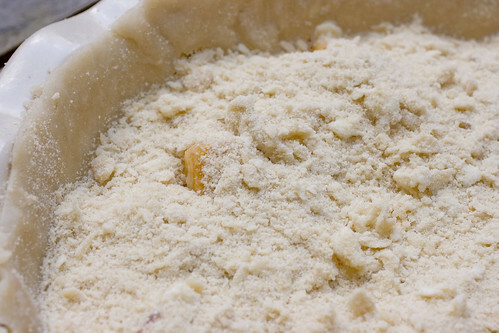 Cut in shortening and butter, with a fork or pastry blender, until it resembles coarse sand. Sprinkle water over it and toss together with a fork. When it starts to come together, push it into a ball with your hands. Wrap with plastic wrap and chill for at least 30 minutes before rolling out. 2. 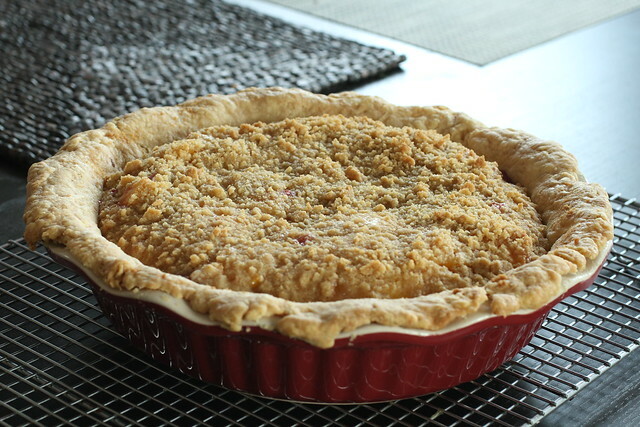 Preheat oven to 350 degees F. Roll out pie crust and lay into 9″ deep dish pie plate. Cut off excess dough. 3. 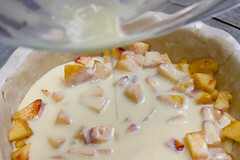 Start filling the pie by spreading the peaches in the pie crust/dish. In a medium sized bowl, whisk together sugar, flour, and salt. Mix in sour cream, eggs, and vanilla extract, until well combined. Pour on top of peaches. 4. For the topping, stir together flour and sugar in a small bowl. Use a fork or pastry cutter to cut in butter, until it resembles course sand. Sprinkle it over the peaches and sour cream mixture. 5. Bake for 50 minutes, or until bubbling lightly and golden. Cool on the counter completely before covering and refrigerating overnight. Serve cold. *Update 9/22/09: When I made this pie, I had no idea 5 Star Foodie (Natasha) had put out a Peaches ‘N Cream Makeover challenge. Hilarious that the round-up was that particular and that I made something suitable without even knowing it. If you want to make something with peaches and cream, checkout 5 Star Makeover. posted by jessica	at 08:45 AM	Filed under Desserts, Recipes. You can follow any responses to this entry through the RSS 2.0 feed. Both comments and pings are currently closed. Bill, how far in advance do you think? What a feast for the eyse!! Georgous!! Yummyyyy I need to try out this recipe asap! Just looking at the picture is pure perfection. You got so lucky with that pie dish. Can’t believe you found it for $3! And thanks for sharing this recipe. It’s like peach cobbler but in a pie. I love getting cheap stuff at TJ Maxx! The pie looks lovely. 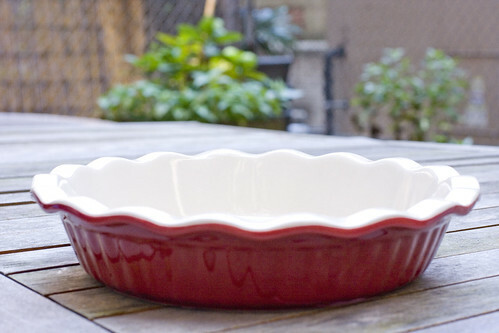 What an adorable pie dish! That pie looks amazing. $3 is a steal! 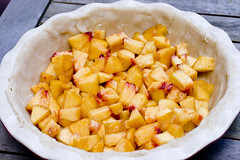 I spied some peaches at our farmer’s market last weekend (couldn’t believe my eyes), and I have a pie plate just like that (also red, which makes me wonder..) so I’m putting this on my to-bake list for the week. As reader, I’d definitely like to see recipes at least two weeks before so I can prepare them one time as a standard dinner item before trying them at Thanksgiving. I think it would be cool for you to suggest like 4 dishes for your readers (or even do a “Pre-Giving”) in which you prepare a Thanksgiving feast prior to the real holiday. Anyway, just a thought. As it stands now, I need to prepare a side dish and I’m thinking of doing string beans lightly blanched and then blistered in hot oil topped with sea salt and shallots. Bill, I’ll put it on my calendar. The string beans sound great! 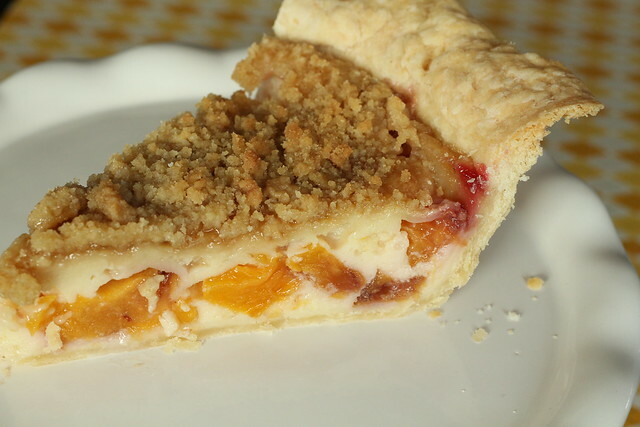 The peaches and cream pie looks outstanding! A perfect holiday dessert! Peaches and cream pie? Amazing! Ingenious!! tj maxx is an awesome, awesome store, and this is an awesome, awesome pie. peaches don’t usually tempt me, but i have a powerful craving for them now! vat a perfect dessert. love peaches. yummm! I’m attempting this (but with a graham cracker crust, since I have a ton of them and no expertise with making dough pie crusts) tomorrow. I shall report back! Soopling, that should taste fantastic because the sour cream mixture makes it kind of like a lighter cheesecake. Can’t wait to see a picture! what a fun way to do peaches and cream.I can’t believe I let the whole summer go without a peach pie. Made this yesterday! It was easy to put together and tastes as good as it sounds. Have to make another one to take to work tomorrow!! !